I love corn chowder, to me it is one of the most satisfying meals. I enjoy the sweetness of the corn balanced with salty pork, garlic and cream flavors. I began by cooking a pound of bacon in a large pot until crisp. The pork fat to me is the starting off point to a chowder of any kind. To this I add a combination of sliced onion, garlic, 2 cups of sweet corn, celery, cumin, ground guajillo pepper, bay leaves. I stirred in 2 tablespoons of flour I continued to cook this for another 5 minutes before adding about a half a can of beer. The flour will help to thicken the soup and give the chowder a better consistency. To add a little spice and roasty flavor to the chowder I added a few poblano peppers that I roasted on the stove. I cooked them on all sides until a bit charred then put them in a plastic bag for about 5 minutes before peeling off the skin. The last component of the chowder was roast chicken. I spatchcocked the chicken and rubbed in a combination of garlic powder, onion powder, guajillo powder, cumin, mexican oregano, salt and pepper. 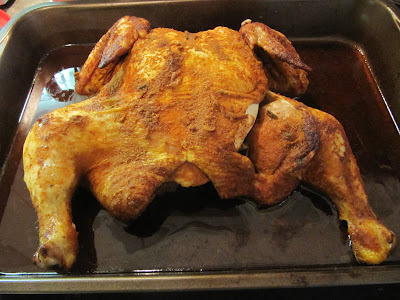 I placed the chicken in a pan with a bit of beer on the bottom, covered with aluminum foil and roasted at 250F for 45min, then removed the foil and cooked at 400F for another 20min to crisp up the skin. I diced the poblanos, shredded the chicken and added both to the pot along with 2 cups of chicken broth, and a half a cup of heavy cream that I blended with an additional half cup of corn, this helped to add creaminess as well as additional thickness to the chowder. I let this combination simmer for 10 minutes to let all the flavors cook down together. The chowder had a good consistency to it and the corn flavor came out and mixed well with the poblano peppers.